On Wednesdays, Joel sails. He usually ends up grabbing a bite to eat with the rest of the boat crew at a bar near the dock. Needless to say, I'm generally on my own for dinner every Wednesday during the summer. I have come to enjoy those night (sorry hun!) because it allows me to make something for myself that he might not particularly enjoy and not feel bad about it. Take this meal, for example. I found it on In Good Taste. When I showed him what I was thinking, he said "Um, I'm not really a fan of eggs benedict..." so I knew that it would become dinner on Wednesday! I was particularly excited to make this dish because eggs benedict is on my list of things to make this year. Does it count if it doesn't have the traditional hollandaise sauce on top? Either way, I'm checking it off my list! Heat a medium saucepan filled with water. Crack eggs into 2 small bowls and gently dump the poach the eggs. Meanwhile, toast the English muffin. When the muffin has been toasted, spread it with butter. Top each half of the muffin with a slice of mozzarella cheese. Drizzle the top of the cheese with a little bit of olive oil and sprinkle with salt and pepper. Place a slice of tomato on top of the cheese and then top that with avocado slices. Using a slotted spoon, place one poached egg on top of each half of the English muffin. 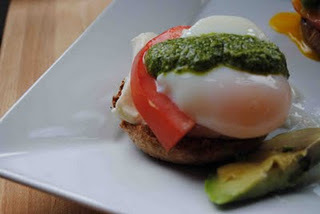 Dollop each egg with a spoonful of pesto.